Jace Vernon and Curtis Pace, two successful entrepreneurs, recently launched Ydraw, a new and improved video marketing business. 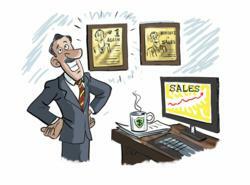 Ydraw specializes in a new trend of videos made with whiteboard animation. Ydraw is the #1 video scribing company in the WORLD! We are Fun, we want your business, and we Love you! Jace Vernon and Curtis Pace started their video marketing business in pursuit to make a whiteboard animation video for their own company, at a lesser price and at a quicker turn time than what was on the market. Seeing the success of their first video, they decided to expand their business and share with others their success on whiteboard animation videos. Starting from two determined entrepreneurs, Vernon and Pace have created a team of hard working employees, who together strive to produce top-notch whiteboard animation videos. Ydraw’s team gives specific attention to every detail, because they understand that attention to details are ultimately what makes a whiteboard animation video amazing. Ydraw’s artistic team consists of Disney animation artists, who work for amazing prices. These artists are the best in the business, there is no other place where companies can get whiteboard animation videos at a better price and quality than at Ydraw. Ydraw is now one of the leading companies in creating whiteboard animation videos, all because of Jace Vernon and Curtis Pace’s search for more affordable video advertising, great customer service skills, and the never-ending drive to succeed. They have worked hard to provide businesses with top quality whiteboard animation videos.